Elevated American classics & cocktails presented in a warm, relaxed space lined with dark wood. Long-standing pizza parlor offering hearty, hand-tossed pies, pastas & draft brews in a homey space. Classy tavern & patio with a big beer selection, elevated bar eats & live music in smart digs. Sophisticated tavern with stone & plank decor, serving upscale comfort food & a broad whiskey menu. 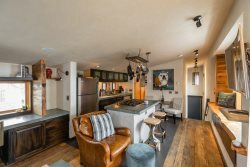 located in the heart of historic downtown Bozeman and situated on the creek that runs through it, is an urban oasis with creek side dining. Fresco still offers it�s excellent, made from scratch menu and a unique selection of Italian wines and local brews. Colorful counter-service joint offering inventive, globally-inspired burritos, plus wraps & salads. Straightforward bar featuring a wealth of TVs showing sports, a burgers-&-wings menu & billiards. Our restaurant menu features mouth-watering steaks served for lunch and dinner. 1/2 pound burgers and tasty sandwiches are also proudly served. Stacey`s is a steak-and-potatoes kind of place. You will feel comfortable here in almost any attire. Homey place with a rustic vibe serving hearty breakfast plates all day, plus burgers & sandwiches. Ted`s Montana Grill is an American restaurant chain specializing in bison. Relaxed spot offering a diverse menu (including fajitas, pizza & burgers) & draft craft beers. Cozy bar & eatery serving up burgers & pub grub in a low-key, old-school setting. Come in to try the must have menu item Jody`s Shrooms! !